This salad is by no means complicated. It isn't even that exciting, but is is so good, well, I forgot to take pictures (what you see is the soon consumed leftovers - in my finest plastic, no less)! Truly, I can't tell you if it tasted so good because of the ingredients or because of who I shared it with. We invited some old friends to stay the night while they make their way around the country on their band, Buried Beds', summer tour. Since they were due in around dinner time I decided the best thing to do was look in our own backyard and make whatever I could with food that either came from our garden, the farm up the street, our CSA, or the farmer's market. What we ended up with was a simple but tasty menu. It's amazing how soul satisfying and uplifting reconnecting with old friends can be - in this case they brought us two new friends as well. I only wish they could have stayed longer because it was so wonderful to share our space and time with them. Baby Eh wholeheartedly approved as well - both of the leftover pizza and new friends. In a bowl throw two handfuls of salad greens. Add two handfuls of cherry tomatoes or diced up two medium sized heirlooms (if you can get them). Add two avocados, diced. Seeing a theme here yet? Two scallions, chopped up. Then, get the freshest, sweetest corn you can lay your hands on. 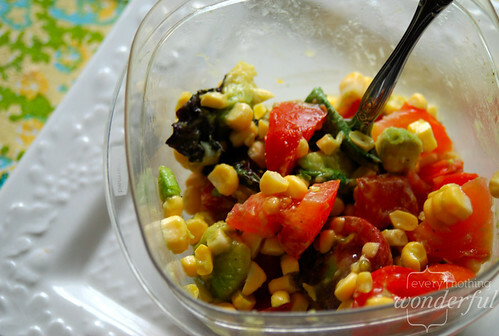 Cut the corn off the cob and throw into the salad as well - no need to cook! Now that you've got your main ingredients ready you can either mix the rest in a bowl and pour over as a dressing or put them on the salad one by one and give it a good toss (My, less dishes method). Dressing: 2 tablespoons good quality oil - I used a garlic infused grapeseed oil, the juice of one larger lime, salt, pepper, a minced clove of garlic. That's it. You could add jalapeno for some spice but I forgot until the salad was already on the table and it was perfectly tasty without it. P.S. - If you check out the band you won't be disappointed. Give them a listen! No kidding, this weekend on PBS I saw someone making a salad very close to this one and I forgot to write down what was in the dressing, and have been trying to remember ever since. The TV salad was roasted corn cut from the cob, diced red peppers, celery & onions, avocados (added last to keep the color). Tossed in an oil/lime juice/salt/pepper dressing. I've been dreaming about it the last few days because it makes me think of summer.